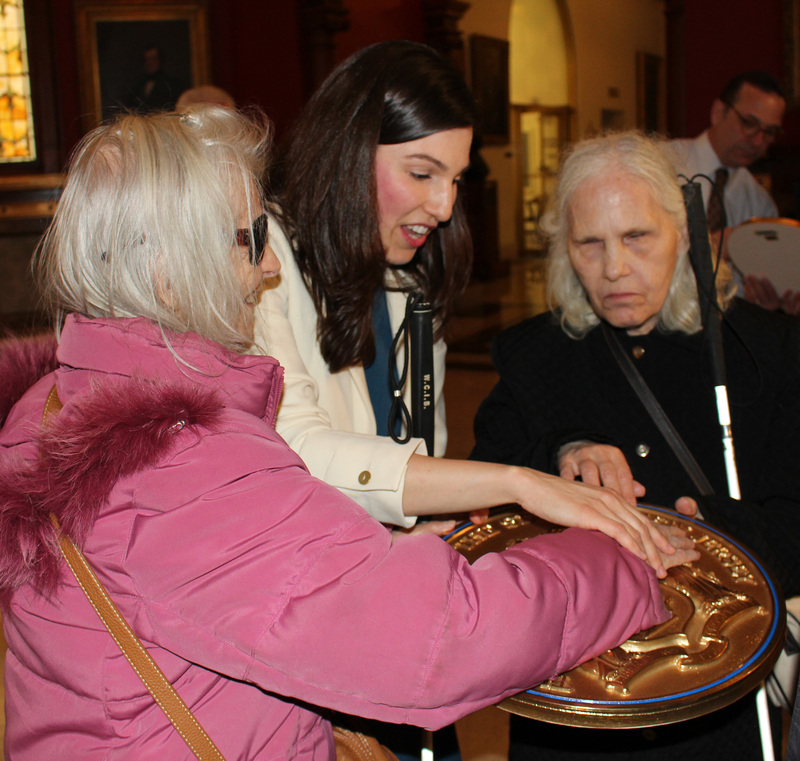 On March 28, a small group of patrons of the NJ State Library’s Talking Book and Braille Center participated in a pilot program for a tour of the State House for those with visual impairments. Conceived by David April, tour program coordinator, and Jennie Leibert, tour program educator, the tour received rave reviews from the participants. David April, tour program coordinator, describes State House Dome using model. 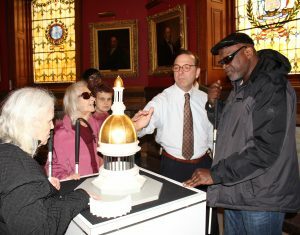 Beginning in the Rotunda, participants were given a description of the area and then were able to touch a model of the State House Dome and the State Seal. Next stop was the Governor’s Outer Office where they all had the opportunity to step behind the podium where governor’s have given many press conferences. At the entrance to the Legislative Chambers, the Boehm porcelain figure, featuring official NJ flora and fauna, was described. Noted was the reason for the presence of one ladybug. Jennie Leibert, tour program educator, describing State Seal. Participants then got to sit in the seats of legislators in the Assembly and Senate chambers, learn how voting takes place and got to hear a few minutes of a recorded meeting. Participants were enthusiastic about the program continuing. Some of the comments were: “wonderful tour,” “I liked being able to touch things in the rooms,” “I liked being able to touch the seal and the dome model.” All said they would recommend the tour and would promote it in their groups.